My experience with mental illness might be similar to some people’s experiences with mental illness, but in other ways it is probably different. I suffer from anxiety and depression, which is actually common among the population. However, from my experience, when I suffer from anxiety and depression, it doesn’t seem like it’s that common. In fact, it feels quite isolating. My anxiety is pretty broad, in the sense that I tend to worry about a lot of things. And on the other hand, it is more specific and intense with other things, such as major transitions, food, germs, social situations, and physical sensations. Some of my anxieties with food and germs can bring out OCD-like behaviors. The most prevalent somatic symptom of anxiety that I get is abdominal pain, and when it gets really bad, I have to lie down in order for the pain to go away. My depression can be described as complicated and messy. Over the past few years, I have lost interest in many things that I used to enjoy a lot, and I deal with feelings of hopelessness and wondering if I will ever get better. Similar to my anxiety, I tend to feel more depressed during transitions, such as heading back to college after summer or winter break. Additionally, I feel like I can be misunderstood a lot, which makes me feel incredibly disconnected from other people, my friends, and at times, even my own family. And sometimes, I just feel really sad yet I cannot explain why. And for a long time, I have wondered why I feel so depressed at certain times of the year, or why I get depressed after certain activities that are not even that significant. This feeling of not knowing why makes my mind spiral uncontrollably. But arguably, the biggest challenge that accompanies my anxiety and depression is that I don’t tell people about it. I mostly discuss these problems with my therapist, doctor, mother, and maybe 1 or 2 friends. Other than that, I don’t talk about it with other people for the fear that they will judge me and not take me seriously. So, most of the time, I just keep my thoughts and feelings to myself, and fight my battles silently from within. Some of my fears are rational – some people don’t know how to respond when a friend tells them they suffer from mental illness because they aren’t familiar with it, and that is understandable. Unfortunately, other people will shut you out when they find out that you have a mental illness, because they will assume that you are crazy or are always in a bad mood. And with all of this, my world becomes very, very small. Slowly, I’m getting better. Currently, I’m in graduate school working towards a master’s degree (my desired profession requires one). I’ve been going to therapy for the past 5 years, and I’ve been on medication for about 2 years and counting. 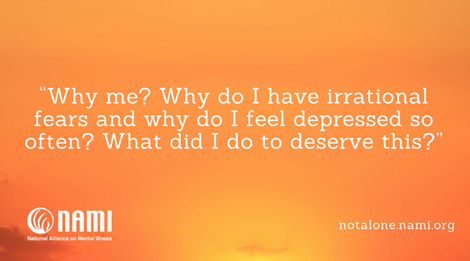 I sometimes wonder when I will no longer need to go to therapy and when I will no longer need medication to feel less depressed. I even question at times, “Why me? Why do I have irrational fears and why do I feel depressed so often? What did I do to deserve this?” While these are valid questions to ponder, I have to accept that medication and therapy are what I need right now. And who knows, maybe I will need medication and therapy for several years to come, but that is okay. As long as I keep taking my medications, going to therapy, getting up and out of bed every day, and surrounding myself with people that I love and activities that I enjoy, then I will be all right.